As you plan your Ft. Worth landscaping, keep in mind the benefits of using native plants. These indigenous options will require water in amounts produced by natural rainfall, they can resist the North Texas heat and using them in your yard helps create an identity for this region. Often referred to as a “wildscape”, the use of native plants creates a terrific habitat through a natural landscape design. Natural landscapes and native plants are harmonious with nature. This approach will provide food for wildlife while the style of a natural landscape provides safe nesting. Consider using an orderly approach in your landscape by creating your garden from a design perspective. If you use fundamental elements like rhythm, line, accents, color and texture, you can fashion a natural landscape that is pleasing to the eye. Rhythm in the garden, like with music, is created through repetition. In a landscape you create this rhythmic effect by repeating a specific shape, color or texture. A mass of color or texture is more pleasing to the eye than a hodge-podge of miscellaneous plants. While rhythm creates a soothing landscape texture is important because it adds contrast. The spiky stems of Yucca or Lindheimer Muhly pull in the eye, especially when planted in beds containing other native plants with a more delicate texture, such as Salvia Greggi or Zexmenia. You will discover that line is quite important to your Ft. Worth native landscaping. A strong line will direct an observer’s eye more effectively than other design elements and the use of lines can be continuous or dotted. A line that is curved typically creates a relaxing environment and is more at home in a natural landscape. Keep in mind that the eye will follow the complete flow of a curve. You can control the view of your landscape by controlling the beginning and end of the line’s arc. Paths are an important element in the native landscape because they can help develop the line you desire. Using paths has a twofold benefit: paths easily direct visitors and you can use them to create a very pleasing design. Other features which offer good line options include dry creek beds, retaining walls and patio edges. Using native perennials in your Ft. Worth landscaping offers a wide range of color. 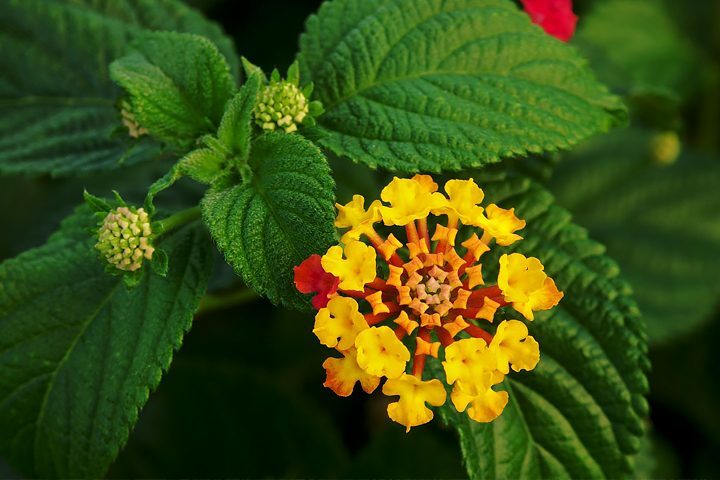 For a pop of orange try Flame Acanthus (Anisacanthus quadrifidus wrightii), Texas Lantana (Lantana urticoides) and Texas Botony (Stachys coccinea), all of which have a long blooming season. For an evergreen option consider Crossvine (Bignonia capreolata) which will bloom for around two weeks. A outstanding splash of color in striking red is found in the Texas Star Hisbiscus (Hibiscus coccineus) which makes a powerful accent. For a shady spot, try Cedar Sage. To attract sweet hummingbirds to your native landscape plant Turk’s Cap (Malvaviscus arboreus var. drummondii), Red Yucca (Hesperaloe parviflora), or red Autumn Sage (Salvia greggi ). For sun-loving yellow perennials a few popular natives are Zexmenia (Wedelia hispada), Sundrops (Calylophus spp. ), Black-eyed Susan (Rudbeckia hirta),and Four Nerve Daisy (Tetraneuris scaposa). In a shady spot you will get a yellow pop from Hinkley’s Columbine (Aquilegia hinckleyi). Blues and lavenders are a more restful option to the color pallet and create a lovely background. Mealy Blue Sage (Salvia farinacea), Spiderwort (Tradescantia spp. ), Fall Aster (Aster oblongifolius), and Prairie Verbena (Verbena bipinnatifida) are some of the blues frequently chosen for Ft. Worth landscapes. Many gardeners often neglect the use of white but they are many great native choices. Some white perennials are Gaura (Gaura lindheimeri), Angel Trumpet (Datura wrightii), and white Autumn Sage (Salvia greggii). White blooming trees include the Kidneywood (Eysenhardtia texana), Mexican Plum (Prunus mexicana) and Roughleaf Dogwood (Cornus drummondii). Pinks are abundant. The showy seed heads of the Gulf Muhly grass (Muhlenbergia capillaris) are a charming cloud of pink when lit by a morning or evening sun. Pink perennial bloomers for use in north Texas landscapes are Autumn Sage (Salvia greggii ), Rock Rose (Pavonia lasiopetala), Purple Coneflower (Echinacea purpurea), and Winecups (Callirhoe involucrata). There are many reasons to use native plants in Ft. Worth landscaping. Minor objections include lack of choice but that’s just not the case. Use these terrific choices in your yard and reap the benefits that native plants provide for gardeners and for wildlife.